I’ve had conversations with many who want to know about the process of writing a book and having it published. Usually they have their own stories to tell and a desire to express what has been bottled up inside for years. Sometimes events are better expressed with the written word. I like to call them pages from the heart. A person can be published by a publishing company or self published through a printing company. Either way, it’s a tremendous amount of work and very expensive. My manuscript, A Child Is Missing was accepted by Tate Publishing. A contract was involved. Being a first time published author there was an investment fee of four thousand dollars. This fee assures the company you will finish the manuscript. It is not reimbursed until 5000 books are sold. That’s a lot of books! Other expenses are promotional tools, traveling expenses, and time. Purchasing a supply of books for yourself is important. This supply is for personal sales and for book signings when the venue does not purchase their own or runs out. Some of that supply will be given to family, friends, and others as gifts but also used as a way to promote the book. Promoting takes time and dedication. The publishing company will promote your book but you must spend hours promoting it with them. I recently interviewed him because of the dedication he’s had for decades on wanting to see the 1973 murders of Anne Psaradelis and Diane Compagna solved. He was also influential in pushing for the Cold Case Unit in New Hampshire. Mr Horak has spent thousands and thousands of dollars to have his book published. Will he ever recover the money he has invested? I don’t think so. Did he do it for financial gain? I think not. Was it done because he has a passion for justice and as he stood over the bodies of two young girls made a promise to them that he would never give up trying to convict their killer? Absolutely! Passion involves sacrifice. 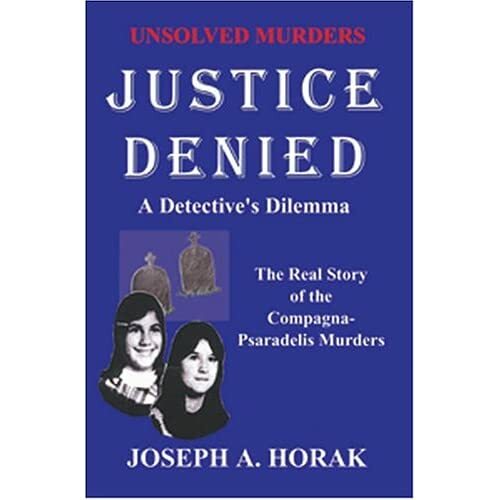 You can purchase a sign copy of Joseph Horak’s book by contacting him at PO Box 273 Henniker, NH 03242. A portion goes to a reward fund for Anne and Dianne. The cover on the revised edition is different. Tate Publishing receives tens of thousands of manuscripts a year and publishes about three percent. A manuscript goes through a number of reviews before it is accepted. If it doesn’t make it through the first review it’s been rejected. Before you receive an acceptance letter the publishing company has already spent thousands of dollars on your work. It is reviewed by numerous people within different departments. Two things they consider is your ability to write and the marketability of your book. Make sure you understand your contract. Some companies will publish your manuscript but require that you buy a substantial amount of books once it’s in print. This expense could be as much as ten thousand dollars. It took me over a year to write A Child Is Missing and the editing process the same before the manuscript was ready for print. Editing is exhausting. You must be willing to add, subtract, and rewrite numerous times. I went through three stages of editing before it was ready to print. My zeal to write A Child Is Missing came from the story itself, not from any possibility of financial gain. If financial gain is the reason you’re writing, it is a good possibility you will face disappointment. My reward was seeing the manuscript transformed into a book and knowing that after I’m gone Kathy’s story will be in print forever. Success in life is measured in many ways. If I’ve made a difference in one person’s life, to me, I’ve achieved success. I am more than willing to answer any questions you might have. Take the journey, write….. This was both helpful and encouraging. As I start my journey to find a publisher for my first book detailing how my sister’s abuduction affected me and my life, I have learned it is far more difficult and time consuming to have a book published than I ever thought. I expected it would take time yet still wasn’t prepared for the waiting game. Your words remind me to keep striving towards my goal. I know “Where’s Heidi? The Search Begins” will help other siblings greiving the loss of their own brother or sister. I may never be economically rich but the feedback I’ve received so far is worth more than all the money. May lifes be transformed, healed, and full of joy through my words and God’s strength. I pray that you will see your dream unfold in 2012. Be of good courage, and never give up on the desire of your heart. I’m saddened to know of others who have suffered such a loss as mine. Your strength comes from the Lord and He will direct your path. Press on!